Every woodworker should have a handmade instrument in their portfolio. We'll help you build your first... or your hundredth! 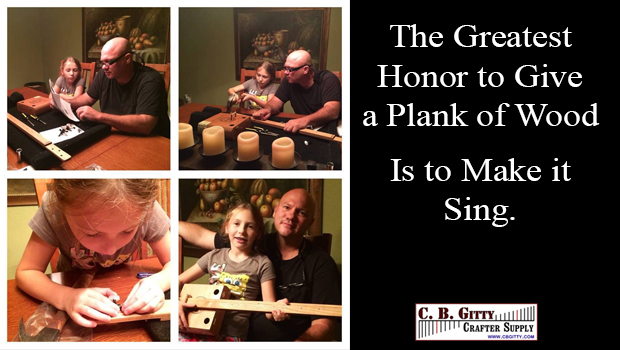 Around here, we're in love with the primitive instruments of the American Depression Era, especially cigar box guitars. They're the perfect starting point for any level of builder -- and because there are no rules, they can provide a lifetime of exploration for the craft. Did we mention that they sound great, too? One quick browse through our online catalog and you'll start to realize the many instruments you can create. Don't get overwhelmed... this will probably become one of the most fun projects you'll ever build! You can build your own musical instruments, and make muisic with them. You can do it. We can help.